Fun and festive, with lively bubbles and adorable sizing, the trend of popping off mini bottles of bubbly as bridal shower favors and wedding guest gifts continues with great gusto. Though not limited to wedding wonders, mini bottles of sparkling wine and Champagne are also debuting at baby showers, birth announcements and New Year’s Eve shindigs along with serving as convenient happy hour finds when opening a whole bottle for a single glass just won’t do. Many customers stop by Wine.com scouting for “mini Champagne” or sparkling wine bottles, which are 187 ml bottles, referred to as “splits” in the wine industry. 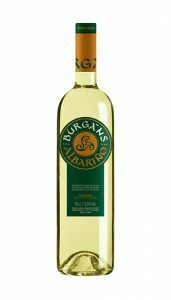 Essentially, a split is one-fourth of a full sized, standard 750 ml bottle of wine. 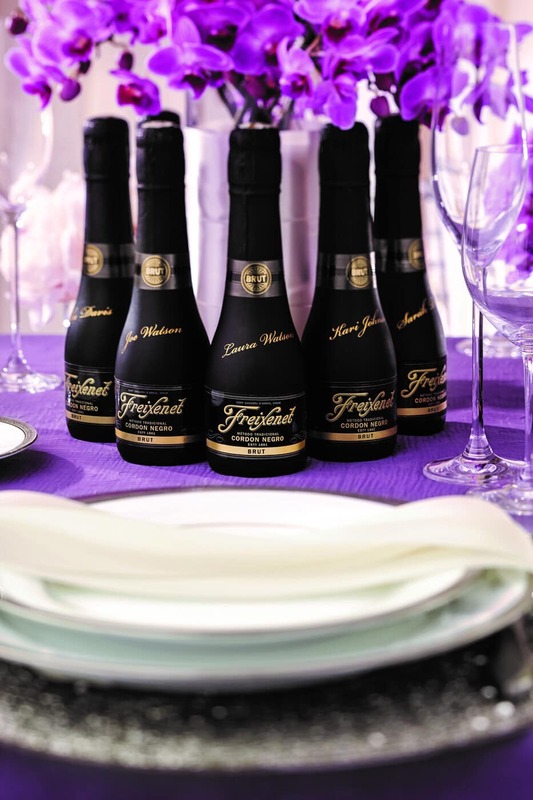 These bottles are remarkably trendy and carry all kinds of grapes from just as many regions; however, keep in mind that only the bottles bottled in Champagne, France are considered “mini Champagne” – everything else is sparkling wine. Serving sizes are 187 ml or approximately 6 ounces. Most Champagne flutes hold about 6 ounces of bubbly, so most pours run closer to 4 ounces. Keep this in mind, if serving the wine in glassware instead of from the mini bottles with a straw. Minis are easy to decorate with ribbons, custom name labels or served with brightly colored paper straws to match themes or festive color schemes. 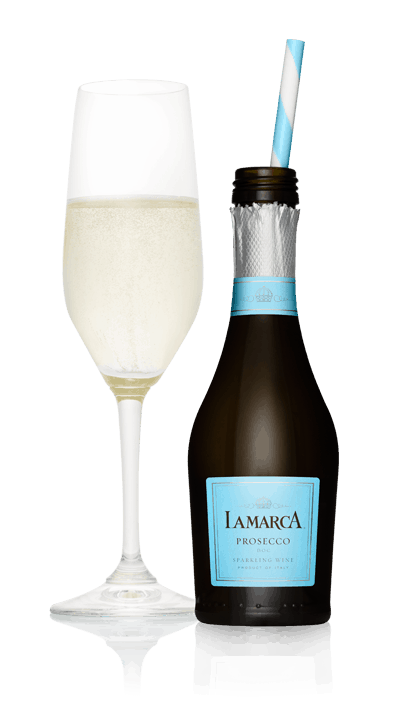 La Marca Prosecco – these snappy little blue bottles of bubbly bliss offer up a lively layer of fresh citrus and green apple with a splash of white honey blossom in the mix. Based on the Glera grape out of the Veneto region, Prosecco is Italy’s easy answer to the best of budget bubbly. Intended to be consumed while young and fresh, and in its hometown of Veneto, Prosecco is typically served in a white wine glass instead of a sparkling wine flute. Incredibly food-friendly, give these bubbles a go with all sorts of appetizers including plates of antipasto, the classic prosciutto and melon, chips and dips, salads, shellfish and much more. 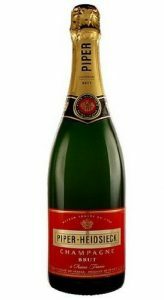 Freixenet Cava – Fun and feisty, Spanish Cava is made in the same method as Champagne (with the second fermentation taking place in the bottle), but built with the local grapes of Macabeao, Parellada, Xarel-lo and more recently Chardonnay. 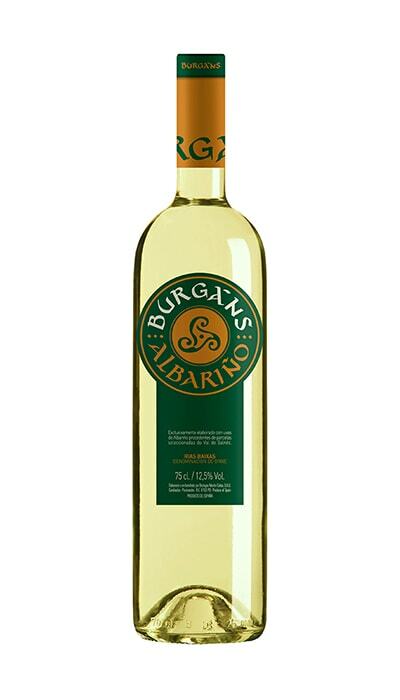 With an aromatic offering of apples and almonds this decidedly dry, medium-bodied Spanish sparkler is dressed to impress with the formal black and gold labeling at an exceptional price point. Perfect for pairing with Cava’s hometown ham, aka Jamón Serrano, Spanish almonds, a variety of tapas, smoked salmon appetizers and sushi. 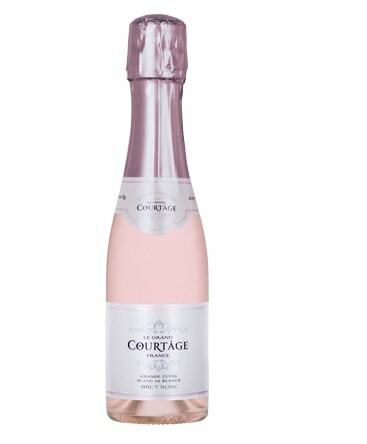 Le Grand Courtage, Rose Brut – Just plain pretty. This may be the quintessential bridal shower bottle. Elegant, feminine and packing some serious French flare, these bubbles are based on a heady mix of Chardonnay for depth and texture, Ugni Blanc to bring vibrant acidity, and the Gamay grape to showcase red fruit character and a dash of color. Like many French sparklers, this brut rose presents almost unlimited pairing potential. Sip with everything from pizza to pasta and sushi to barbecue along with chicken salad, baked brie or fig and ricotta spreads. 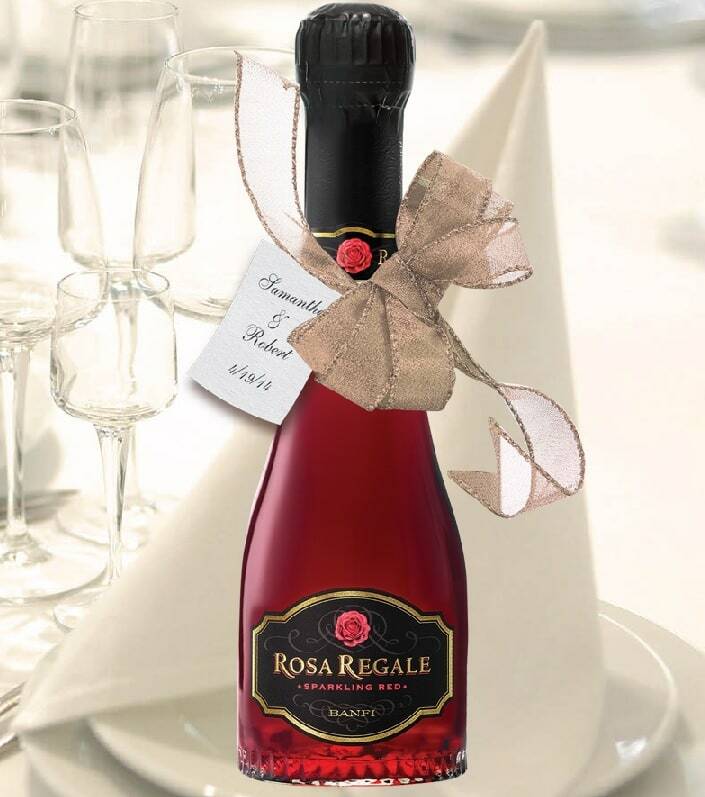 Banfi Rosa Regale Brachetto – Looking for something red, sweet and bubbly? Italy’s low tannin, light-bodied, low alcohol, sweet styled red sparkling wine, dubbed “Brachetto,” has got you covered. Hailing from Italy’s Piedmont region, the black-skinned Brachetto grape delivers exceptional aromatics. Expect ripe red fruit like strawberry, raspberry and currants wrapped in roses to swoop out of the bottle. Brachetto also enjoys a bit of lover’s legend, as stories swirl that both Marc Antony and Julius Caesar gave Brachetto to Cleopatra in savvy attempts to win her heart. In terms of pairing potential, Brachetto is a top pick for dessert pairings. Consider giving it a pour with chocolate mousse, German chocolate cake, seasonal fruit and berry dishes, chocolate sundaes, cheesecake, bread pudding and more. Moet & Chandon Imperial Brut Reserve – Technically, this is our only “true” Champagne in this feature. While we are often asked about our “mini-Champagne” bottles for weddings and party favors, many customers are truly asking for bubbles in a bottle, not necessarily Champagne. Keep in mind that Champagne is only Champagne when it’s made in Champagne, France. Enter Moet & Chandon, the world’s biggest selling Champagne brand with 30 million bottles sold annually. 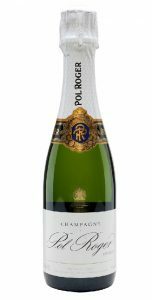 This bottle of mini bubbly is a top pick wine for those that would like to toast with a classic, dry style of Champagne carrying zesty citrus and Granny Smith apple, with remarkable acidity and an ethereal mix of smoke, brioche and hazelnuts. 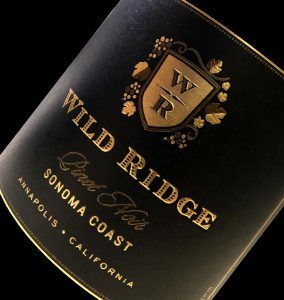 Classic pairing partners include shellfish, caviar, poultry, smoked salmon and many fried food finds that marry well with the exceptional acidity and bright bubbles.